1855 classification - Premier Grand Cru Classé Château Haut Brion is famously the only estate in Graves to have featured in the 1855 classification reflecting a long established reputation, even if, at the time, the crown was beginning to slip. During the 16th Century, Haut-Brion was briefly owned by Jean de Ségur of the Ségur family who at various times owned both Lafite and Latour. Jean de Pontac inherited Haut Brion as a wedding dowry in 1525 and, apart from a brief period during the French Revolution, his descendents owned the estate until 1801. The Pontacs were an interesting lot, including in their number a very pious Bishop, a politician, and François-Auguste Pontac who started a London inn called l'Enseigne de Pontac where Samuel Pepys enjoyed "a sort of French wine called Ho Bryan", finding it "hath a good and most particular taste". Jonathon Swift, however, thought the wine "dear at seven shillings a flagon" - 35p a bottle, if only! Haut Brion was the first Bordeaux wine known to have been imported into the USA when Thomas Jefferson had six cases shipped home to Virginia. Eventually, in the earlier years of the 19th Century, Haut Brion found its way into the hands of the Larrieu family. Preceding reputation was enough to get Haut Brion classified as a Premier Grand Cru Classé in 1855, and a string of copy cat estates appended "Haut Brion" to their names (a source of some litigation in the 1920's) but in reality the 19th and early 20th Centuries were not great times for the wines of Haut Brion. When the bank seized the assets of Milleret Larrieu after WWI, the estate fell into the hands of the Société des Glacières under who's unenlightened guidance much of the gardens were sold off the make way for expanding city of Bordeaux. They then offered Château Haut Brion to the City of Bordeaux, who turned it down, allowing American financier Clarence Dillon to realise his dream of owning a Bordeaux château, buying the estate in 1935. His descendents own Haut Brion to this day. The gravel soils of Haut Brion are planted with 45% Cabernet Sauvignon, 40% Merlot and 15% Cabernet Franc for reds, and a more or less 50/50 split of Sauvignon Blanc and Semillon for the whites. There are around 45ha under vine. Haut Brion were one of the first estates to ferment in stainless steel. After fermentation, red wines spend up to two years in oak, previoulsy 100% new for the grand vin but, now, more like 35%. 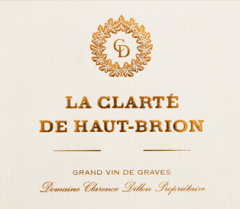 The second wine of the estate was known for many years as Bahans Haut Brion, but was renamed recently as Le Clarence de Haut Brion in honour of Clarence Dillon.